Locksmith Dunfermline services may be required for a variety of reasons. Reasons such as being trapped outside due to a lock mechanism failing. Maybe a home owner has lost their keys after one too many at the local? Maybe new tenants want the locks changed on a property their moving into? Another reason could be locks needing upgraded to comply with home insurance policy. whatever the reason you require a locksmiths in Dunfermline for, Alcatraz is the company for you! 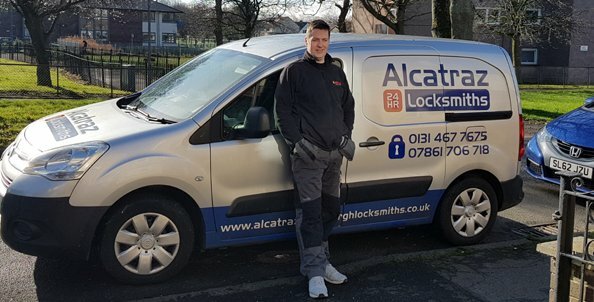 Locksmith Dunfermline: what makes Alcatraz locksmiths different? We are different in many ways from your conventional Dunfermline locksmith. To begin with, when people call some companies for a quote, they may find the company is unwilling to provide a quote over the phone. They will say they ‘need to see’ the job before give an accurate quote. They say this for a good reason. They know when they meet certain customers face to face, the customer finds it hard to say ‘no’ – even if they are quoted hundreds of pounds! At Alcatraz – Edinburgh locksmiths we do not conduct ourselves in the above manner. By asking are series of questions on the phone, we are able to identify your lock and security issues no problem at all. Therefore, we can give you an idea of the price involved and what the job will entail. This is because we have nothing to hide. we do not look to ‘sting’ every customer for the maximum amount of money. We see the bigger picture when it comes to working ethics! We know that after completing a job the customer will recommend us to their friends and family. The work we get from these recommendations generates more work and so on – kind of like karma. This is why we have become one of the most used mobile locksmiths in central Scotland. 24 hour locksmiths in Dunfermline – are rarely that! On more than one occasion we have travelled to Dunfermline through the night. Only to be told, we were the only company who answered the phone? We believe if you advertise as a 24 hour emergency locksmith, you should be willing to go out at all hours – without hesitation. As we’re based next to Glasgow road in Edinburgh we would be looking to be at any part of Dunfermline within 15 minutes of receiving the call. We actually enjoy the serenity of going out through the night. Driving over the forth road bridge at night, to the historic town of Dunfermline, what is there not to like? Sometimes when people have issues with their locks, these problems can be stemming from an underlying issue. For example, if a door or window is not closing properly, we can make minor adjustments with the hinges and keeps to make it work better. However, if the door or window is too far gone for a minor adjustment, it may need the services of a joiner / UPVC installer. This is where Alcatraz -Edinburgh locksmiths can save you money too. We regularly pass over jobs to the tradesmen mentioned above. They in turn pass jobs over to us regarding specialist lock work; such as installing digital locks. This cooperation between trades benefits the customer in 2 ways. Firstly, they get the job done properly by a ‘specialist tradesman’ – not just a jack of all trades! Secondly, The customer benefits from a reduced labour rate from the tradesman taking over. This is an agreement we all have in place. It insures none of our customers get ripped off, and are happy with the price they have paid. We know a happy customer is a returning customer! if you require a free quote or want a chat about your security concerns, drop us a call any time, or contact us on one of our social media platforms.